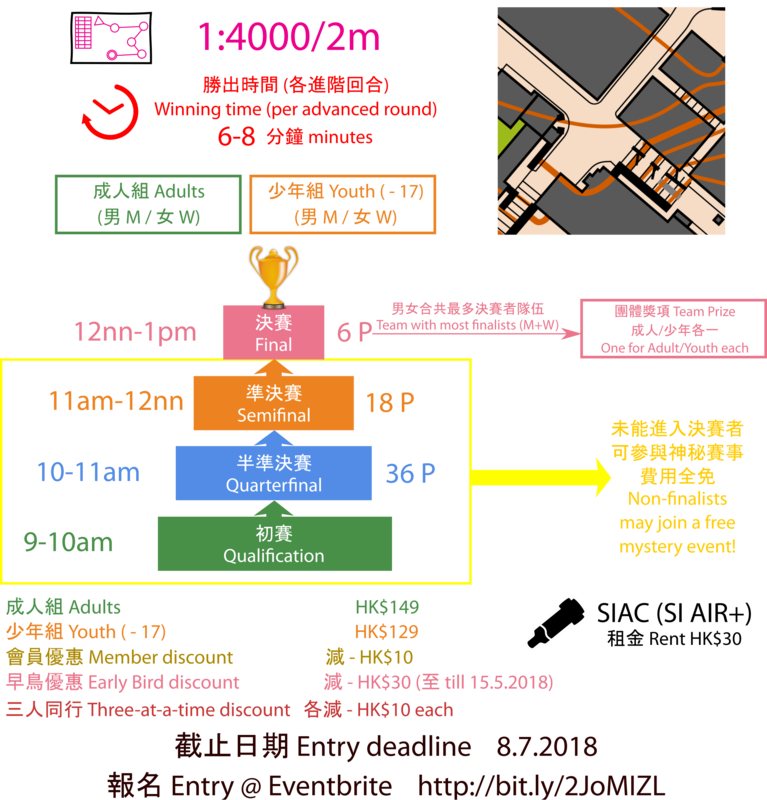 (最新 New) 早鳥優惠延長至五月三十一止 Early bird discount extended to 31 May! Come and try the new Third Sprint Format (sprint knockout)! The forking mode will be announced in the Event Information. If you are eliminated in any round, you can still experience the course after mass-start, or join the mystery event later in the afternoon! We recommend everyone to read the "Sprint WOC—3rd Format Description" by the International Orienteering Federation (http://bit.ly/2IO221Q). The event flow and round times will largely follow this document, and will be announced in detail in the Event Information. *Only three rounds if 36 competitors or less (no qualification). Event information and Start list will be announced one week prior to the event. Male, Female class will have three individual prizes each. Competitors may build their own team on this entry platform. The team with the most finalists wins the team prize (one prize for male and female combined).